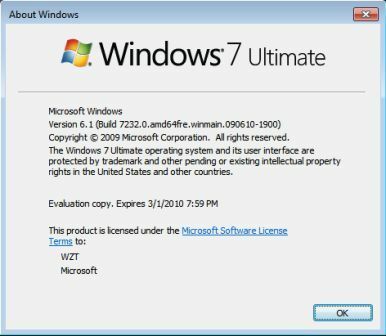 Only 32-bit (x86) version of Windows 7 Build 7231 was leaked, but 64-bit lover can take heart that a 64-bit (x64) version of Windows 7 Build 7232, a newer build has also been leaked to Internet, and available for download via BitTorrent network. However, similar to Windows 7 Build 7227 and 7231, the leak is also in VHD virtual hard disk format, which may be useless for some non-technical people. Windows 7 Build 7232 has the full build tag string of 6.1.7232.0.winmain.090613-0700. Thus, the build was compiled and signed off on June 13, 2009. In Windows 7 Build 7232, the wallpaper of installed system desktop background is no longer the betta fish wallpaper, but has been changed to probably the Windows 7 RTM official wallpaper. It probably indicates that Windows 7 Build 7232 is much closer than RTM than any previous builds, and probably is RTM-Escrow build. Note that the original VHD is packed in RAR archive with RAR file size as 2,513,064,106 byte and SHA1 hash is 90286CA644BBBD7C6B4BF1D6E6696064DA825839. Again, an installation DVD ISO of Windows 7 Build 7232 x64 has been created from the VHD image, by using loader from Windows 7 7229. However, an original Windows 7 Build 7232 x64 OEM version is said to be leaked, and attached below.